Phang and wife Goh Yoke Lean. Born in 1945 in Ipoh, Phang Chew is a familiar face in the Perak capital. Not only is he instantly recognised by his peers in the motorcycle business and superbikers but also by art lovers who have been following his journey as an artist. 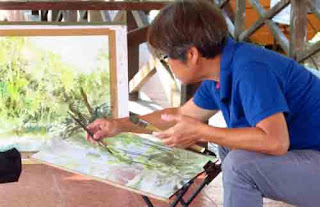 Phang can be often seen painting the street scenes of Ipoh old town or capturing the beauty of the tin-mining town’s outskirts. 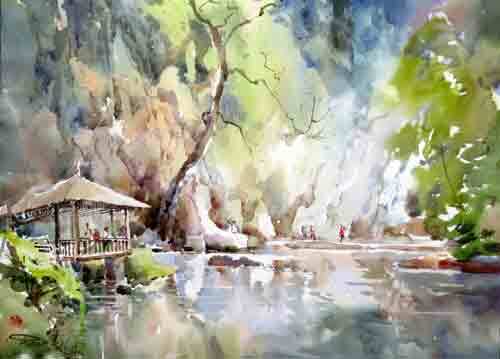 Sometimes he paints alone or with his artist friends, but on most outings, he is joined by his wife, Goh Yoke Lean. Mrs Phang is also an accomplished painter. Looking more youthful than his 70 years, Phang received his secondary education in Yuk Choy High School, where his artistic journey began. Recollecting his early years, Phangattributed his early interest in art to his art teacher Hu Zhui Guang. “Hu would ask us students to do murals for the school and encouraged us to take part in art competitions if we wanted to see how good we were,” said Phang with excitement in his voice. “That was when I discovered that I have a talent in art. Despite being busy with his business, Phang continued to paint after work hours. His wife, who was also helping him in business, shared his love for watercolour. When they were free during the weekends, the couple would seek out subjects for their watercolour paintings in places far and near. These ranged from the scenic hills of Tambun to the old houses in quaint villages in Batu Gajah. Six years later, that decision led to Phang holding his first solo show in Kuala Lumpur at the Balai Berita gallery of the New Straits Times Press (M) Bhd. Today, leading a more relaxed life fulfilling their passion, Phang and his wife, who are also founder members of the Perak Art Society, continue to contribute to building Perak’s watercolourists. During the weekends, the couple teaches school children watercolour painting. If Phang finds his students’ interest waning, he tells them how lucky they were to be able to have access to proper art instruction. “I tell them that when I was their age, even if I had money, there was no one to teach me the proper way of painting. 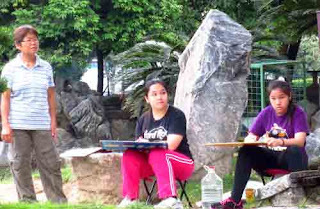 On the other hand, they are more fortunate as they are not only able to learn art from a senior artist like me, but they also have access to good art materials to produce good works. “Painting in watercolour is not just about putting colour on paper,” said Phang who credits his knowledge in watercolour to his Singaporean artist friend Peh Eng Seng. 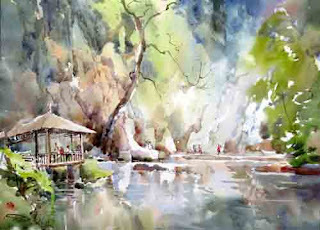 “Watercolour painting is a very powerful way to express one's feeling. It can be effectively used to represent the vision of the artist on a piece of paper,” said Phang who prefers to paint on site. As the couple enjoys their twilight years pursuing their passion for art, Phang has only one immediate task. “As a senior artist, I want to keep myself as healthy as I can so that I can do better paintings, hold more solo shows and contribute to the art scene.